Julia Iliopoulos-Strangas is Professor Emeritus at the University of Athens, Law Department. She became member of the Athens Bar in 1974 and is admitted as an Attorney to the Supreme Court (Arios Pagos). 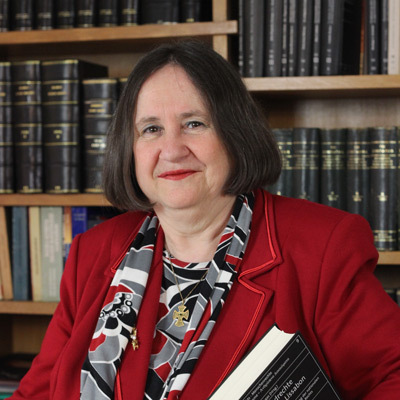 Until her retirement in August 2016, she has taught Constitutional law, European and Comparative Constitutional law, and International and European law with a particular focus on the protection of human rights (ECHR, EU Charter of Fundamental Rights). Up until completion of her doctoral thesis at the Law School of the Hamburg University, she has been Assistant at the German Public law and at the Economic Law departments of the University of Hamburg. Subsequently, she has been a frequent visiting professor at the Law Department of the Hamburg University, the Law Department of the Strasburg University, and the Law Department of University Paris II. Furthermore, she has served as a member, and for two years as rapporteur to the UN-Committee against torture (CAT) from 1993 to 1997. She has been a member of the governing board (1997-2001) and Vice-President (2001-2005) of the Association of Greek Constitutional Lawyers. From 2003 she has been a member of the governing board and from 2009 to 2016 President of the “European Association of Professors of Public law” (“Societas Iuris Publici Europaei”). She has also been the first “foreign” member (i.e. a member who is not Professor at a German speaking University) of the German Association of publicists (“Deutsche Staatslehrevereinigung”). In addition, she has served two tenures as a member of the governing board of the International Association for Constitutional law. Since 2000, she is member of the “Comparative Study and Research Group on Constitutional Justice” (“Groupe d’Études et de Recherches compares sur la Justice Constitutionnelle”) of the University of Aix-en-Provence. She has been member of the Hellenic National Bioethics Commission (2009-2014). Since 2004, she is member of the governing board of the “Organization for the Construction of the New Acropolis Museum” (OANMA) and she has been member of the management board of the Acropolis Museum (2009-2014). She speaks Greek, German, French and English.